My name is Mark Brayne and I am a Blogger. An addict, clearly. But Dorie said she’d appreciate some final, final thoughts, so, unable to resist another tipple, here’s a first batch. Climate Change. Take a deep breath. The picture illustrates, from Dunkirk, the quandary we’re in. Oil refinery in the background – the real stuff of global addiction. 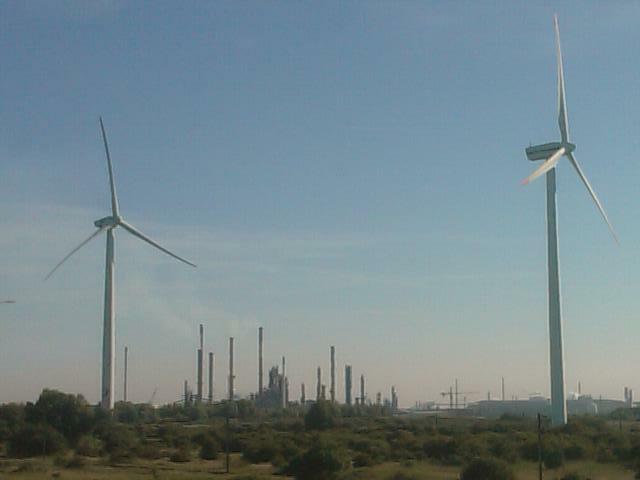 And windmills closer up – perhaps little more than an alibi function, too little too late? I thought a lot on the bike about what’s awaiting humankind in the coming years, and probably a lot sooner than most people realise. And came to a list of fairly straightforward conclusions. We, as just another species thrown up by evolution, are programmed to procreate, and multiply. We can’t help that. That’s the way – like other organisms from amoeba through ants right up to gorillas – we’re built. Our problem – no great insight, this – is our gigantic, conscious brains. And the science-based ability they have given us, discovered only in the past few hundred years, to switch off evolution’s normal selection survival-of-the-fittest procedures. The result? A recipe for disaster. Malthus in fact got it right – he just got his timing wrong. It’s not that we’re burning fossil fuels that’s the core problem. It’s that there are too many of us doing that for the planet to cope. As animals first and humans only second, we are not capable of regulating our numbers. And we are not capable of sufficiently limiting our consumption. The result is that, like yeast in fermenting beer, we are partying like there’s no tomorrow. Which, as for yeast in beer, there won’t be. The sugar/oil will run out, and we’ll be killed off by our by-products – alcohol in the case of yeast, and CO2 in ours. It’s not easy to say this, but history will probably judge medical advances to have been the key development that sealed our doom. In particular antibiotics, and the realisation, with the discovery of germs, of the importance of hygiene. Does science have the solution? Well, it’s science and technological development that have got us into this pickle by interfering with the planet’s natural systems of self-regulation. So I don’t agree with those who condemn discussion of technology-based solutions (iron filings in oceans, mirrors in space, CO2 pumps and the rest) as dangerous meddling. We’ve already dangerously meddled, and although I’m not at all hopeful, without meddling further-but-better, we have no hope. On which click here for an outstanding article by Mark Lynas earlier this week in the Guardian. Straying into really dangerous territory here, the truth is that liberal democracy and the liberal market economy have failed mankind. They cannot allow the difficult, unpopular decisions and leadership which could steer us away from disaster. Is dictatorship the answer? Past evidence is not encouraging. So, as I head for home in just a few days now, do I think it’s still, despite this complete Doomsday scenario, worth hoping and living and loving and longing.